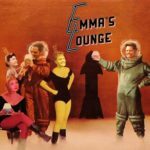 A cosmic party suited for Appalachia as well as Tralfamadore, “Shakin’ and Swayin'” is the first single from Emma’s Lounge, the self-proclaimed “Space Age Folk Wave” quintet fronted by Logan Venderlic. Taken from the band’s debut LP, Heart Heavy, “Shakin’ and Swayin'” is a carnival show that’s equal parts B-52s and Frankie Avalon, taken with a heavy dose of acid. Let loose and stream “Shakin’ and Swayin'” below and purchase Heart Heavy directly from the band here.